As much as 80% of your immune system is tied to your digestive tract. 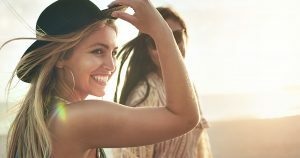 Not only is gut health good for overall well-being, it’s essential to protect against colon cancer, one of the most common cancers in both men and women. Here are 7 food “do’s” for good gut health. Many leafy green veggies such as kale and spinach stand out as superfoods. They’re low in calories and high in nutrition. They also have special phytonutrients that are protective, such as detoxifying chlorophyll. Aim for raw veggies when possible so they come with the digestive enzymes needed to absorb nutrients. Raw means you’ll get the greatest level of vitamins, including folate which is needed for healthy cell replication. Grasses are also in this category. While barley and wheat are technically grains, during the grass stage these tender shoots are nutritionally closer to green veggies. 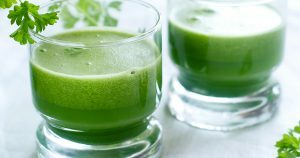 Aside from proteins, vitamins, and minerals, barley grass comes with superoxide dismutase, a “super” antioxidant for cellular support. Alliums are the class of veggie that includes garlic, onions, leeks, shallots and chives. 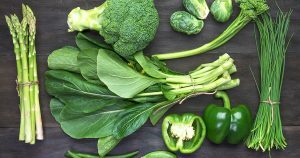 These veggies stand out for their antioxidant properties and are used by the body to make glutathione, a master antioxidant essential for detoxification. One large scale study published in the American Journal of Clinical Nutrition (source) showed those consuming the most onions had a 56% lower risk of colon cancer. Need more reasons to add onions? They have also been shown to be protective against gastric (stomach) cancers. Broccoli is a sulfur-rich veggie that comes with a special compound called sulforaphane. It’s ONLY found in cruciferous veggies and broccoli has the most. 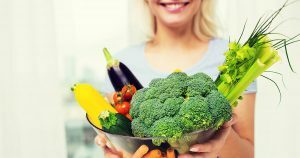 Sulforaphane is widely studied for its ability to suppress cancer through stopping HDAC, an enzyme involved in the progression of cancer cells. 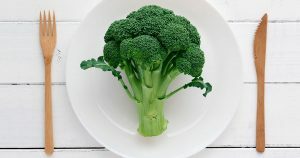 Broccoli also boosts immunity with vitamin C. Just one cup gives you 81 mg, your daily requirement. Since cooking reduces nutrients, opt for raw broccoli. Eating red and processed meats is linked to higher rates of colon cancer. Especially when those meats are cooked at high heat, like with grilling or frying. Organic and grass fed meats are fine in moderation since they tend to be leaner, and have a better nutrient profile with beneficial essential fatty acids. If you do opt for occasional barbeque or flame-grilled steak, add a side of onions or broccoli to help offset harmful compounds created during the cooking process. There’s a battle going on in your digestive system every day, and fermented foods are the reinforcements you need to win the war. That’s because they repopulate your gut with good bacteria or probiotics. These good microbes can make vitamins, banish bloating, and make it difficult for infections to take hold. These foods include kimchi, sauerkraut, kefir and kombucha. If going for yogurt, make sure it has probiotics listed on the label. You can also give your good bacteria a boost with a probiotic supplement. Look for one with strains of Lactobacillus and Bifidobacterium for the most beneficial types. If probiotics are the reinforcements, then PREbiotics are the rations needed to feed all the healthy bacteria in your gut. While bad bacteria thrive on sugar and fat, good bacteria prefer to feed on fiber found in fruits and veggies. Inulin is a favorite of good bacteria and this fiber is found in alliums (leeks, onions), bananas, Jerusalem artichoke and chicory root. It’s becoming abundantly clear that vitamin D is essential throughout the body and that includes colon health. Studies show low vitamin D is linked to a higher risk of developing colon cancer, while those with the highest vitamin D levels have up to a 70% reduction in risk. Wild fish including sardines, salmon and mackerel are all rich sources of vitamin D. The only plant source of vitamin D comes from mushrooms. Mushrooms (common button) that have been exposed to sunlight do what humans do; they make and store vitamin D.
While most vitamin D in supplements is a synthetic form of vitamin D3, and providers claim this to be more bioavailable, studies show vitamin D2 from mushrooms is equally absorbed in the body. As an added bonus, mushrooms come with antioxidants, B vitamins and beta-glucans to support immunity. Always look for organic mushrooms since mushrooms will readily absorb pesticides and metals so the growing medium must be certified organic. Make these foods part of your meal plans and you’ll be on track for a healthier and happier digestive system. And as an added benefit, your immune system will be stronger and better able to protect you.